Growing up, my grandmother always made sure there was plenty of homemade kimchi in our home. In fact, I didn’t even know commercial kimchi exsited until I was a teenager. Don’t get me wrong. Commercial kimchi has much improved over the years. But believe me; there’s nothing like homemade kimchi. I don’t know why I don’t make it more often. It’s honestly not difficult to make. And there are so many varieties. You can make different types of kimchi depending on what’s fresh and seasonal. You are probably familiar with the stuffed cucumber kimchi, where the seasoning/filling is stuffed in the cucumbers. But that requires a little more labor than I have the time for nowadays. I barely have enough time to eat sometimes. I’m sure many of you are in the same boat. So I decided to make a very quick and easy cucumber kimchi. Call it cheater kimchi if you will. No need to stuff the cucumbers one by one. Just cut, blend, and mix! OK. It’s a little more work than that, but not that much more. This quick and easy cucumber kimchi is super delicious, lower in sodium than the commercial kimchi, and rich in gut-healthy probiotics. Additionally, it contains NO sugar or MSG; unless you’re paying $10+ for a teeny, tiny bottle of the “healthier” kimchi at Whole Foods, your bottled kimchi will likely contain both sugar AND MSG. If you love kimchi, you need to try this! Wash the ingredients well. Cut the cucumbers lengthwise into 2 long halves. If the cucumbers are very thick, cut the halves lengthwise again in half (making four long spears). Then cut the length in half to make shorter spears. Sprinkle the cucumbers with about 2 TB salt and mix well. Allow the cucumbers to sit in salt for about 20-30 minutes. While the cucumbers are sitting in salt, prep your vegetables. In a blender (small handheld one will do), blend loosely chopped apple, garlic, and ginger until smooth. Add loosely chopped red bell pepper to the mixture and blend until the bell pepper pieces become almost smooth. Add honey, about 1 tsp salt, and fish sauce. Stir. Give the cucumbers a quick wash to rinse off the salt. Give the cucumbers a light squeeze to rid of excess water. Drain well. To a large mixing bowl, add cucumbers, sliced onion, shredded carrots, chives. To the vegetables, add Korean red pepper flakes, jalapeño (if using), and the mixture from step 2. Using your hands (use food-grade gloves if possible), mix well. Store in an airtight container. Make sure to pack the cucumbers tightly and to scrape all the seasoning into the container. Place a small piece of saran wrap directly on top of the kimchi to keep it uniformly moist. Store the kimchi in room temperature for about 24 hours. Refrigerate. Serve chilled. If you want to make this vegan, just omit the fish sauce; however, you’d need to substitute the fish sauce with about 1/2 tsp of salt. If you can’t find Korean chives (or any bunched chives, not the ones in the small plastic containers), you can use very thin spring onions or green onions. Just chop them in to shorter/smaller rings than you would chives. If you don’t have any Korean red pepper powder, use about 2 tsp of chili pepper flakes. Just pulse them in a spice or coffee grinder before using. It won’t taste exactly the same, but it will still be tasty. Cucumber kimchi sours very easily. So be careful not to leave it out too long, especially if it’s hot and humid. I made the mistake of leaving one of my jars out for about 1 1/2 days on a very hot and humid day (90+ degrees with humidity!). It went completely sour. During cooler weather, it can be left out for a longer period of time, but be really careful! I loved your Oi Sobagi recipe, it was so good. My fridge is never out of cabbage kimchi either. This looks so good, Gomo! I am drooling over here…would love it now for quick afternoon snack before dinner time:) Have a wonderful Friday and weekend ahead!!!! Thanks Sandra! You should try this. I know how much you love kimchi. :) This can be made in a jiffy. I hope you’re doing well and have a great weekend!! i love this recipe! we’ve only made stuffed and it’s never as good as the restaurant because it doesn’t ferment evenly for us. =( love this recipe but i’ll probably substitute ??? (shrimp idk what? brine/sauce?) for the fish sauce. so good, making this soon! Hi Jasi! You can definitely substitute the fish sauce with saewoojut (salted shrimp). I just prefer the fish sauce for this particular kimchi. When you store the cucumber kimchi, make sure you lay them flat and pack them pretty tight. Additionally, make sure they are all kept moist by putting a piece of saran wrap on top (not on the mouth of the container, but directly on the kimchi). 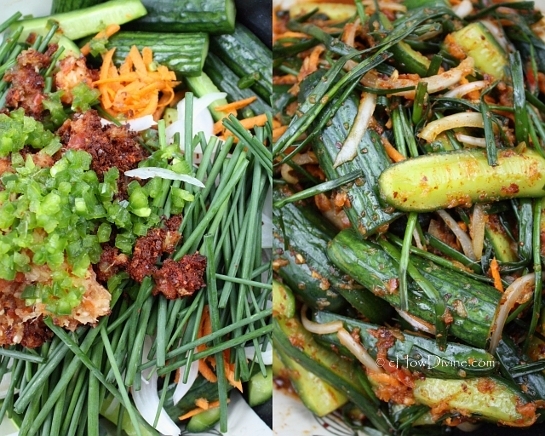 You can see what I mean in a photo over at the stuffed cucumber kimchi recipe. That should ensure that they all ferment uniformly. Thanks for coming by and have a wonderful weekend!!! I love kimchi, but have never made it. I really need to – I know it’s easy. 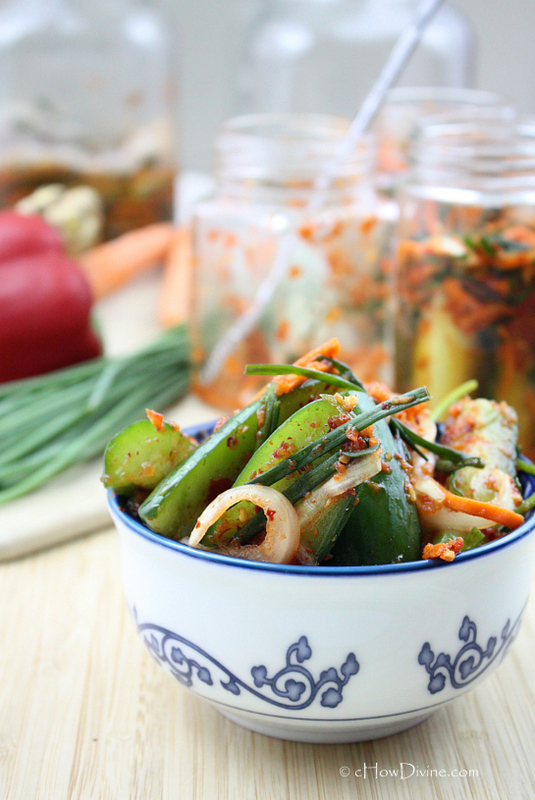 I love the idea of this cucumber kimchi, too – I’ve never had that. Fun stuff – thanks. You really should make it at home! I love that you can adjust the ingredients depending on your taste. I hope you give it a try. Have a wonderful week! Your having kimchi is like me having either a red or green chile sauce. One of the other is always in the fridge with more in the freezer. 🙂 I love all of your recipes with kimchi and now this one with cucumber. It looks and sounds delicious! We definitely have that in common! Whenever I put a new jar of kimchi in the fridge, I get the same feeling I get when I pull out of a gas station with a full tank of gas (which is really really good). 😀 Thanks MJ! Have a great week!! I just had this side dish yesterday at our nearby korean restaurant. My son and I loved it! Will bookmark your recipe for later, thanks! Hi Erin! Oi Kimchi is one of my favorite side dishes. Luckily, it’s so easy to make compared to other types of traditional kimchi. I hope you give it a try. Hope you are well!! OMG looks so yummy! I just love cucumber side dishes. Can’t get enough of them. Sometimes it is all I need with a bowl of rice. Gomo, I also have kimchi constantly in the fridge! This is the only cucumber kimchi I prepare (I am too lazy for the stuffed one) and it’s by far my favourite kimchi when served as a side-dish. I never add apples or bell peppers. It sounds like an excellent idea. Your kimchi looks so delicious, I think I will be making some oi kimchi this weekend. 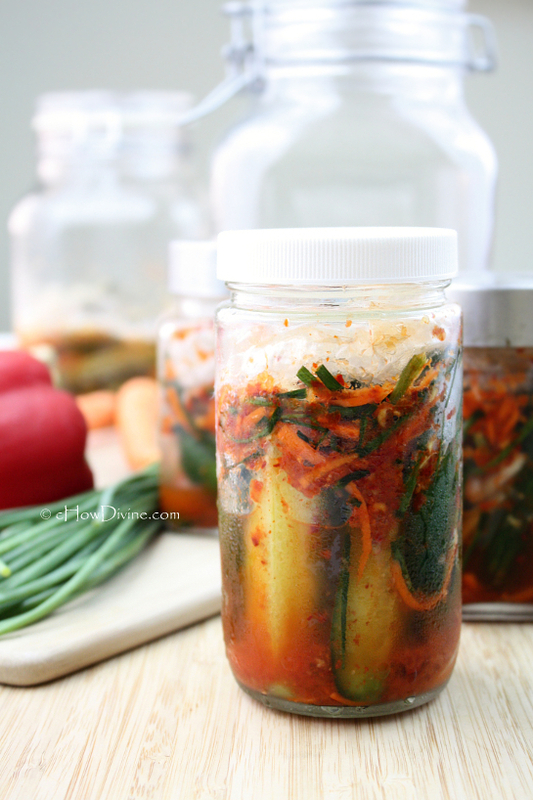 It gives me comfort when I have a full jar of kimchi in the fridge! Weird, right? 🙂 Try it with apple (or Korean pear) and bell pepper. It’s really refreshing. Thanks sissi! 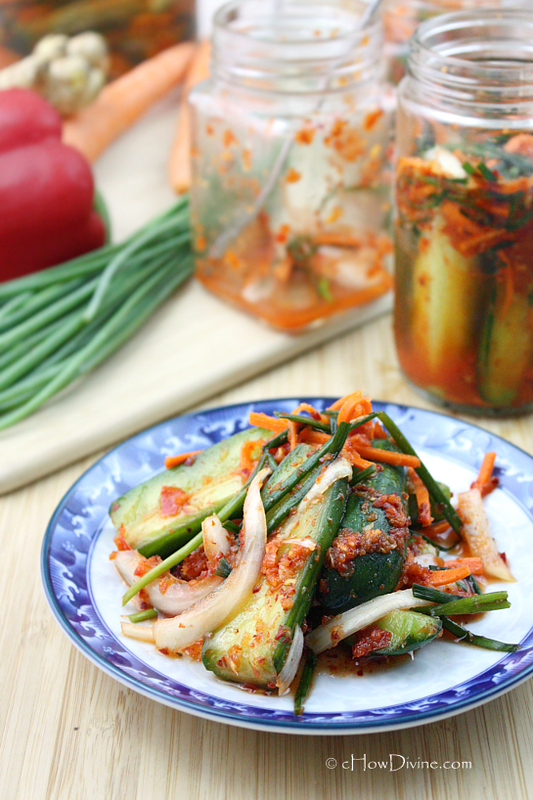 Love this quick and easy recipe for cucumber kimchi. I didn’t expect to see fuji apple in the list. 😀 I love both cucumber and cabbage kimchi. If I omit the cucumbers, will it still sour fast? Hi lex! This is cucumber kimchi. So without cucumber it would just be seasoning. If you omit the kimchi and add more chives, it will become something close to buchu kimchi (Korean chives kimchi). Additionally, if you don’t add the cucumber, there really isn’t anything to ferment. So you should refrigerate it right away. I hope this helps! I have a salty palate, but for me this was sooooooo salty! I even reduced the fish sauce to 2 teaspoons. I rinsed the cucumbers for a minute after salting, but maybe didn’t rinse them enough? Hmm… That’s odd. I’m actually using less salt than most do; but regardless, you are rinsing off the surface salt on the cucumber. Even if you used more salt, you shouldn’t be left with overly salty cucumbers. You would, then, give the cucumbers a light squeeze to rid them of excess water and put them in a colander to further drain. You can taste the cucumber after rinsing to see if they are too salty. They SHOULD be salty, but only slightly so. I hope this helps Dorcas!